While Bryson and I were still living in BC, which now feels like forever ago, we took every opportunity we could to explore our new surroundings and get outside. Every weekend we would pick a new mountain, trail, or town to explore, hop in our car, and go. Out of all the places we've had the chance to experience Bowen Island still holds the biggest place in our memories. On a crisp sunny day we jumped into our car and drove up to Horseshoe Bay where we parked our car and grabbed a ferry over to Bowen Island. 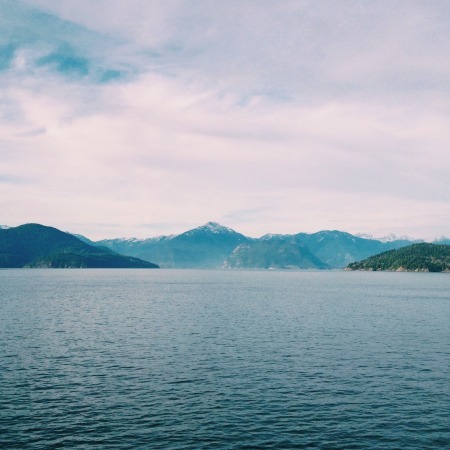 We spent the ride over excitedly taking in the view and beauty of Howe Sound, naturally. After arriving we hurried ourselves off the main road down a small residential street that brought us out to the coziest beach and stream. We took some time to stroll about and appreciate all the island homes while simultaneous dreaming about how perfect it would be to one day own a small cabin or home somewhere on the island before making our way onto a hiking trail. We stopped midday to grab lunch at Snug Cafe where we were served the most incredible homemade tomato soup and sandwiches all while sat in an old cabin like building while watching smoke stacks escape the buildings outside with mountains in the distance- Yes, this sounds cheesy but these really are the type of vibes giving off by Bowen Island. The rest of the day was spent walking through more trails, discovering a small waterfall, and us hurrying back to the ferry terminal after dark almost missing one of the last ferry's for the evening. If you live on the Lower Mainland or happen to be planning a visit we highly suggest you make a day trip out to Bowen Island. We only managed to explore a small portion of the island, but plan on returning the first chance we get!